The AS-1 is the second instrument in Pioneer’s gig-friendly Toraiz range, aimed at live performers and DJs as well as studio dwellers. 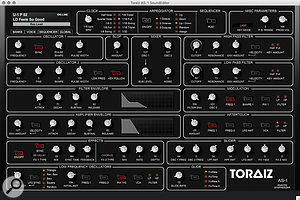 The new Toraiz is a sequenced analogue mono synth with just enough knobbage for meaningful live interaction without requiring synthesis expertise. The tie-in with Dave Smith Instruments is considerably tighter this time. While the SP-16 Sampler (reviewed in the May 2017 edition of SOS) simply had a DSI-designed master filter, the AS-1 is fundamentally a Dave Smith synth, being a single voice from the Prophet-6. AS-1 is a solid little wedge, about the size of a chunky hardback book. Everything about its physical design is tuned for live performance. Note input is via an unsnappable and liquid impervious flat surface rather than a traditional keyboard or pad section. The one-octave strip of triggers below this surface responds easily to a light tap or touch, although sadly it’s not velocity sensitive. While this ‘keyboard’ offers a pretty limited way to play the synth in a traditional sense, its main expected use is to play and pitch step sequences and the arpeggiator. If you need more range and expression, a regular MIDI keyboard can be plugged in round the back, or you can hook up to a computer via USB. The knobs are chunky and nicely spaced out, and the buttons are solid and well lit. 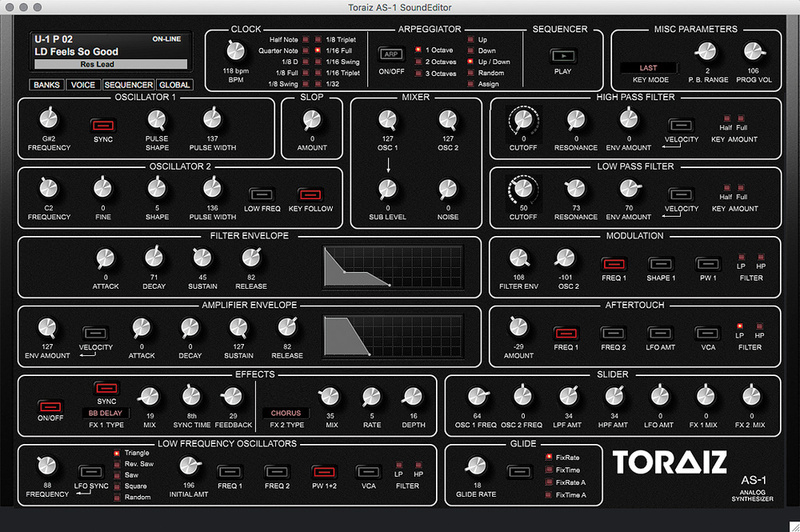 A touch strip at the left supplies simultaneous modulation of up to seven parameters. All connections are on the rear, starting with a pair of stereo main outputs plus headphones, all via quarter-inch jacks. 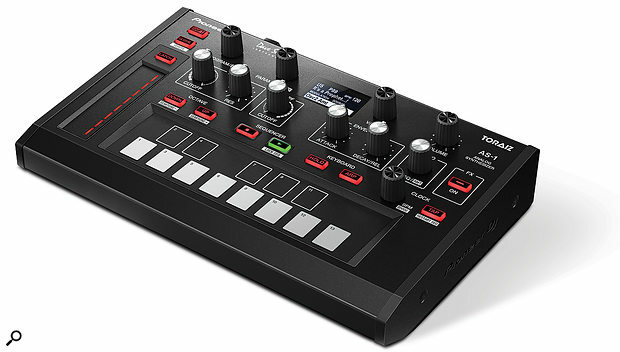 Full-size MIDI ports allow for direct connection and synchronisation with other gear. Unlike the SP-16 there’s no RJ45 port, so the Toraiz can’t directly join a Pioneer DJ-link network. Instead it relies on an SP-16 also being present to pass on clock via MIDI. The AS-1 has an excessively generous 990 patch memory slots arranged as 10 banks of 99. Half of these slots are fixed and filled with factory preset sounds; these patches are duplicated in the five User banks where they can be overwritten. All the factory presets come with pre-supplied step sequences and effects settings and, surprisingly, there’s very little repetition — a testament to the AS-1’s remarkable range and versatility for a monosynth. Each patch has its own sequence of up to 64 steps. 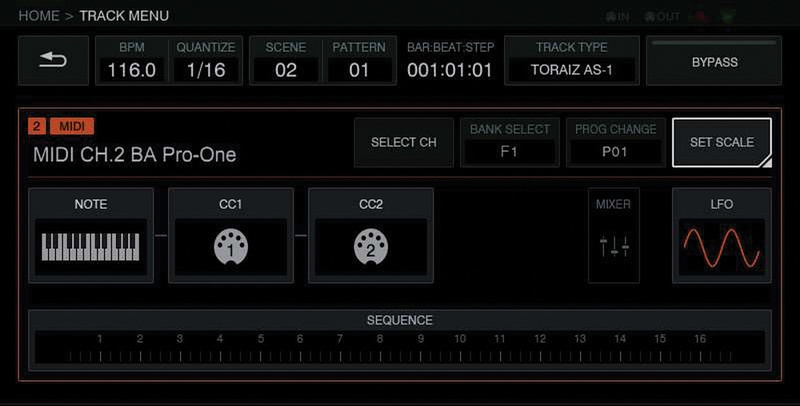 This is a single track sequence for notes only: there’s no automation or parameter lock functionality built-in, although all controls transmit MIDI and all synth parameters can be controlled from external CC or NRPN data. Sequence creation is via step entry with no real-time record option. The AS-1’s rear panel hosts quarter-inch sockets for headphones, stereo outputs and trigger inputs, MIDI I/O sockets and a USB port. If the sequencer is running you can step through presets and each new patch’s sequence will take over. A Lock button provides the option to switch to a new sound but keep the current sequence running, making it easy to browse for sounds. Sequences can be transposed in real time with the keyboard. 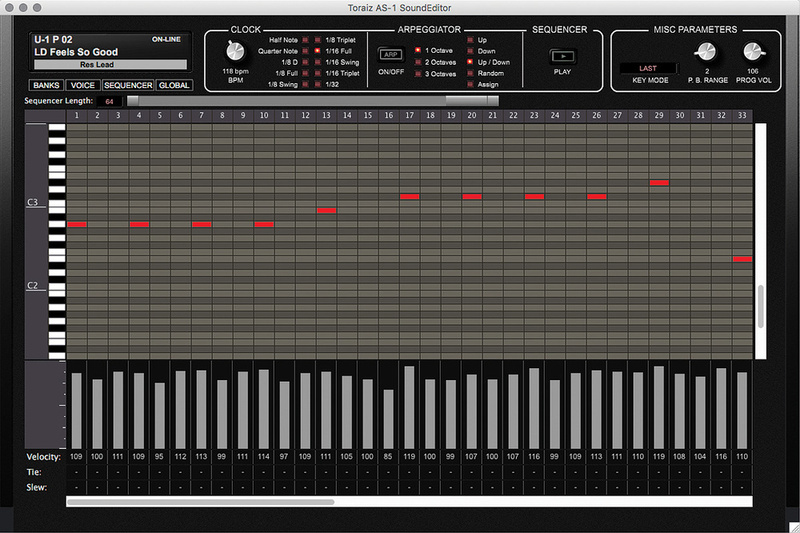 As well as the sequencer there’s an arpeggiator with five modes and up to three octaves range. A key hold button can be engaged if you want to free up your hands: again very useful for DJ or live sets. Further assistance is provided by various Scale modes, which spread musical scales across the white notes on the keyboard. Sonically, the AS-1 is very much recognisable as a Prophet, with that creamy, grown-up analogue character at your disposal as well as bite and squelch when you want it. This isn’t surprising as the architecture is almost exactly the same as the Prophet 6. There are two main oscillators with continuously variable shape from Triangle through Saw to Square. 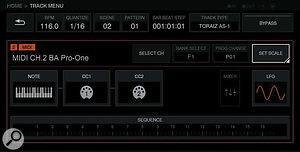 Osc Sync is available, and Osc 2 can be switched into LFO mode and detached from keyboard following. In addition there’s a Sub that tracks Osc 1 and a Noise source. The separate high- and low-pass filters can both be modulated by a single filter envelope and velocity, with keyboard following options of 50 percent, 100 percent or Off. The AS-1 has lost the analogue drive stage found on the Prophet, although this is made up for slightly with a distortion option in the dual digital effects modules. Effect 1 offers this Distortion, or Delay or Ring Mod. Effect 2 has Chorus or three different flavours of Phaser. An FX ON button on the AS-1’s front panel lets you bypass these modules and maintain a fully analog signal path. The excellent Sound Tower AS-1 editor gives you complete control over the ‘Prophet 1’ engine.As well as the filter and amp envelopes you have a single variable-shape LFO, which can be patched to either oscillator’s pitch, the pulse-width of both, the VCA and either filter. There’s no independent modulation depth control for these destinations. The LFO modulation was designed to be scaled with the Mod Wheel on the Prophet 6, but there’s an ‘Initial Amount’ setting that effectively becomes the global LFO mod amount on the AS-1. The Touch Slider can be assigned to work like a the Mod Wheel here, or you could use an external keyboard, which is also your only option for unlocking the synth’s Aftertouch abilities. The additional modulation routings of the Prophets are present here, although of course they’re not polyphonic, as they famously are on these synths. You can patch the filter envelope to a few places, but more interestingly you can use Osc 2 as a modulation source, including cross-modulating to Osc 1, greatly enhancing the synth’s sonic potential. Sequence editing is also available in the editor.The AS-1 ventures into its own new territory with its Touch Slider. It probably would have made sense simply to have this replace the Mod Wheel, and in fact the Strip can control LFO amount in the same way as the Mod Wheel on the Prophet. However, Pioneer and Dave Smith have gone a lot further, not only by allowing you to scale this modulation both positively and negatively, but also letting you assign the strip to another six parameters with independent depths and polarities. Both Oscillator and Filters can be modulated, plus the mixes of FX1 and FX2. This is a huge boost to the dynamic performance potential of the AS-1. For the most part in a live or DJ setup you’re going to be recalling your pre-made patches, playing back the sequencer or arp, and performing some dynamic parameter changes. The six main knobs all have fixed assignments that have been chosen fairly well. Nobody will argue with the decision to lead with Filter Cutoff and Resonance controls. Attack and Decay are also useful, especially as they map to the both the Amp and Filter envelopes simultaneously. I was less convinced about the choice of LFO Frequency for the sixth and final knob, and sure enough very few of the preset sounds are noticeably affected by this. Filter Env Amount, or maybe FX1 Mix, could have been more useful. I did wonder about the choice of fixed pots instead of endless encoders (which are used on the AS-1 for the other knobs). I guess they are preferable for performance once the knobs are in sync with the patch. Luckily you get a choice of three different knob modes. The default is instant take-over, which despite creating a jump puts you in immediate control. There’s a pick-up mode which waits for the knob to move through the current patch’s settings before making changes. Finally there’s a ‘relative’ mode, like Ableton’s Scale mode, that gives you a progressive take-over. This is a luxury rarely seen on comparable synths. I tried out a couple of different live scenarios, clocking from Ableton Live. When slaving, you can set the AS-1 to follow or ignore Start and Stop commands as well as sync to the master tempo, which is helpful. First I tried simply recalling patches and sequences in sync from the AS-1, as I imagine this is how most DJs would work. A handy Quick Programs feature lets you choose 12 patches to recall with a modifier from the note keys. Patch changes always happen instantly: there’s no option to queue the launch to the end of the sequence, and changes are not quantised to a beat either. This means changing a patch needs to be manually timed if you want its sequence to play in step. This is tricky as there’s a tiny pause when you change patches. A Restart Sequence button lets you manually re-trigger the sequence back into time, and is a welcome creative tool for DJs, but a smooth sequence take-over system would be really helpful for stringing together a performance from multiple patches. The dedicated AS-1 control page on the Toraiz SP-16 sampler.I also tried fully sequencing the AS-1 with Ableton Live clips, which worked much better. I was able to add program changes to the clips, and because the AS-1’s knobs transmit MIDI I recorded in automation envelopes, which then played back on the synth. This exercise proved the AS-1 can be a handy little analogue sound module in the studio as well as on stage. Lastly, if you have both the AS-1 and the Toraiz SP-16, there are some extra joined-up features. The SP-16 has a dedicated track program type for controlling the AS-1. This lets you select patches, control parameters and integrate the AS-1 into your SP-16 set. I admit that I was skeptical about the AS-1, maybe a bit put off by the ribbon keyboard. I came to appreciate it as a piece of hardware really well designed for a specific arena: the ever-increasing crossover zone between DJ’ing and live electronic music performance. It’s not only the solid construction; it presents just the right controls for instant gratification. Obviously there’s the usual filter and envelope controls, but the touch strip adds greatly to the dynamics of the unit, with its ability to bend multiple parameters at once. The live DJ workflow could be tightened up a lot if patch/sequence changing could be quantised to bars/beats, but it works well sequenced from Live or an SP-16. 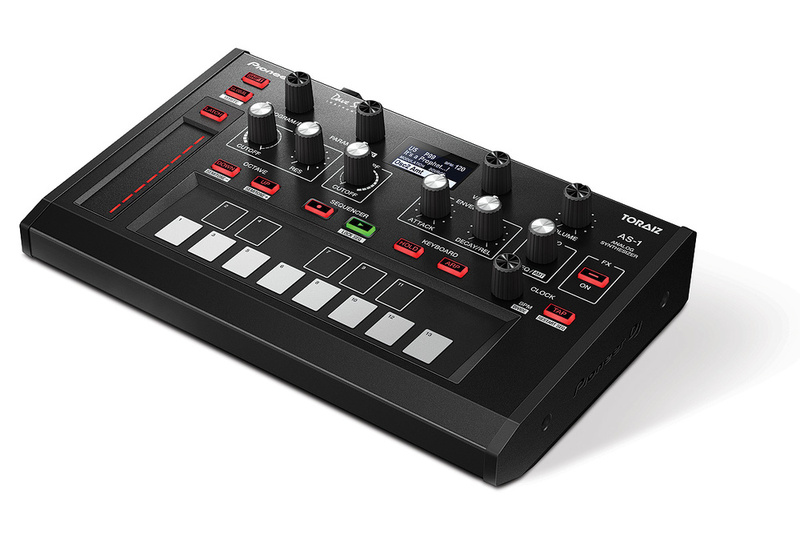 There are a few other crossover products becoming popular with DJs, such as the Roland Aira/TR series, the Korg Volcas, Novation Circuits, etc. The AS-1 can certainly hold its own against these peers, both in terms of usability and sonic heritage. And don’t rule it out as a studio synth. It might have limited hands-on programming scope, but it’s a versatile analogue synth sound module that’s greatly enhanced by the software editor (though a plug-in version would be even better). Not to mention, it’s an honest-to-goodness Dave Smith synth for under £500$500. With just a handful of controls at your disposal, the AS-1 appears to be designed for playing rather than programming, but the full power of that Prophet sound engine is there for the tweaking. From the device itself, you can adjust every parameter one at a time via the screen. You have one knob to scroll through parameters, and another for setting the value. The Shift key lets you skip between different sections, which helps. 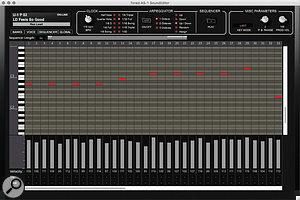 A much better option is to download the software editor, which is developed by Sound Tower who provide excellent editors and plug-ins for many other synths. There’s a free LE version, and a $39 Pro version, but all the important stuff is available in the former. The main Voice editor gives you a complete panel for the synth where you can control the hardware in real time; this also stays in sync with any changes on the hardware. It reveals exactly how the synth works, including stuff you’d probably never grasp from playing with the device on its own. Tuned for gigging and DJ’ing. Very versatile sound palette for a monosynth. Fully featured sound editor makes it a great sound module too. A surprisingly deep monosynth with the classic Prophet sound, all wrapped up into a tidy performance-ready package. Pioneer DJ Americas +1 (424) 488-0480.